Manufacturing industries used to set target to produce FG on monthly, weekly, daily basis, shift basis and monitor the progress every hour to make sure that it produce FG according to the target set. Industries need to know the reason if the set target is not met. 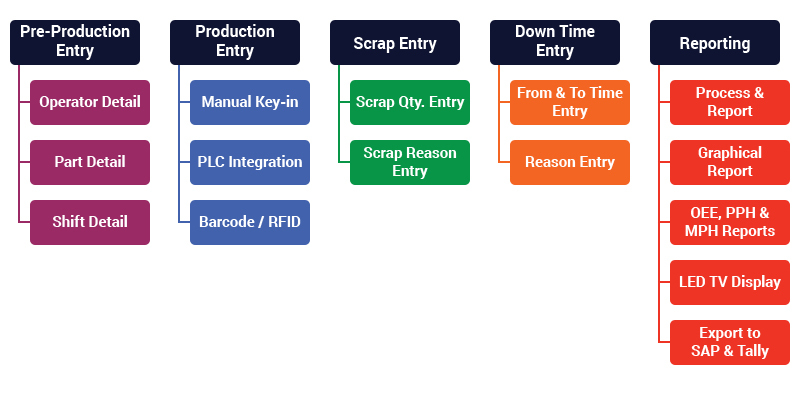 Also, industries need to register operator details, parts detail, scrap quantity, reason for scrap, down time entry of machines, reason for down time and other details. These details are required for reporting purpose and also for the purpose of evaluation of man, machine, and material to arrive OEE, PPH and MHP etc. Production related Data feeding can be manual key-in, capture from barcode or RFID, fetch from PLC machine. Also, the data generated from this system can be exported to SAP, MFG Pro, Tally and any other ERP System. Ess-Matrix Infotech design, develop, implement and maintain customized application software solution for production entry and reporting system for all type of manufacturing industries. Ess-Matrix also provides hardware items that are required for production management such as barcode printers, barcode scanners, RFID tags & readers, LED TV for digital signage along with software solution as a package.